Trisha Krishnan turns 30 today! Trisha was born in Chennai to Uma and Krishnan on May 4, 1983. She has a bachelor’s degree in business administration from Ethiraj College. Trisha won Miss Salem and Miss Madras contests in 1999. Her first screen appearance was in singer Falguni Pathak's music video as Bollywood actress Ayesha Takia's friend. Trisha’s first big screen debut was in an un-credited role as Simran's friend in Jodi. Her first role as a full-fledged heroine was in Mounam Pesiyadhe directed by Ameer, opposite Suriya. Dubbing artiste Savitha Reddy is Trisha’s voice in most of her films. Her Brahmin girl act in Samy opposite the handsome Vikram won her a lot of fans. Trisha’s Telugu debut Varsham opposite Prabhas catapulted her into the big league instantly and won her the Filmfare award. Ghilli opposite Vijay was one of Trisha’s most biggest hits in Kollywood. Prabhudeva’s Telugu directorial Nuvvostanante Nenoddantana opposite Siddharth was a huge blockbuster and won her the second Filmfare award and the Nandi award. She starred alongside the much older Chiranjeevi in Stalin. Sainikudu saw her pairing up with Telugu heartthrob Mahesh Babu. Trisha won over family audiences and her third Filmfare award with Selvaraghavan’s Aadavari Matalaku Ardhalu Verule in which she was cast opposite Venkatesh. Her comic timing was much appreciated in Kireedom in which she was paired with Ajith. Trisha’s film King with Nagarjuna was a blockbuster. She won both, critical and commercial acclaim for her great performance in Radhamohan’s Abhiyum Naanum. Gautham Menon’s cult classic Vinnai Thaandi Varuvaaya in which she was cast opposite Simbu is a milestone in Trisha’s career. She starred opposite Kamal in Manmadhan Ambu which did moderately well at the box office. Trisha made her Bollywood debut with Priyadarshan’s Khatta Meetha opposite Akshay Kumar in 2011. Theenmaar saw Trisha pairing up with Pawan Kalyan for the first time. She has Boologam oppostite Jayam Ravi and Endrendrum Punnagai with Jiiva lined up for release this year. Rumor mills are churning overtime about her supposed affair with the handsome Rana Daggubati and how his family is opposed to the relationship. She lost her father to a heart attack last year. Trisha is very close to her mother Uma who accompanies her to her shootings and functions. Trisha has quite a few endorsements in her kitty including Fanta, Scooty and Vivel. She is an avid supporter of animal rights and has worked extensively with PETA. Trisha was adjudged Indian of the Year by NDTV under the Southern Star category. 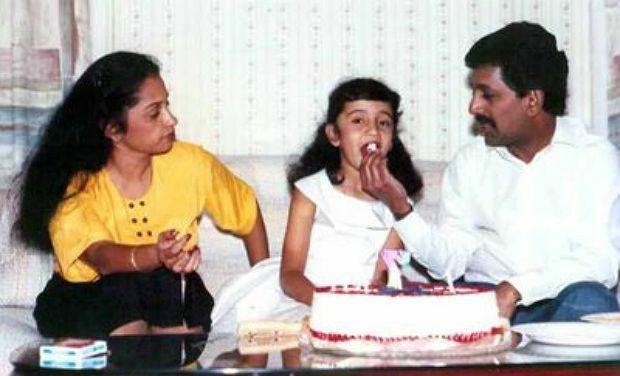 Trisha’s mother Uma was supposedly offered several roles in films which she turned down to concentrate on Trisha’s career. Trisha can converse fluently in Tamil, Hindi, French and English. Beautiful and talented, Trisha career graph continues to grow in leaps and bounds and the pretty actress doesn't look like she's stopping anytime soon. Here's wishing the darling Tollywood and Kollywood queen a very happy birthday!